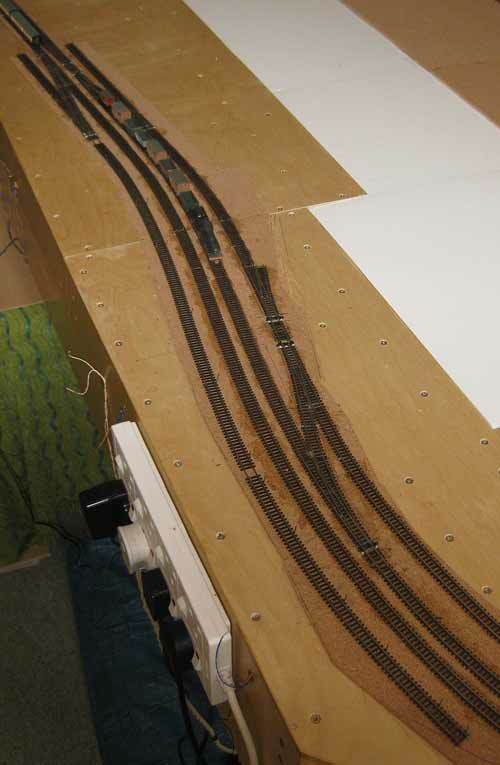 Track is Peco Code 55 and the points are electrofrog, all laid on cork. 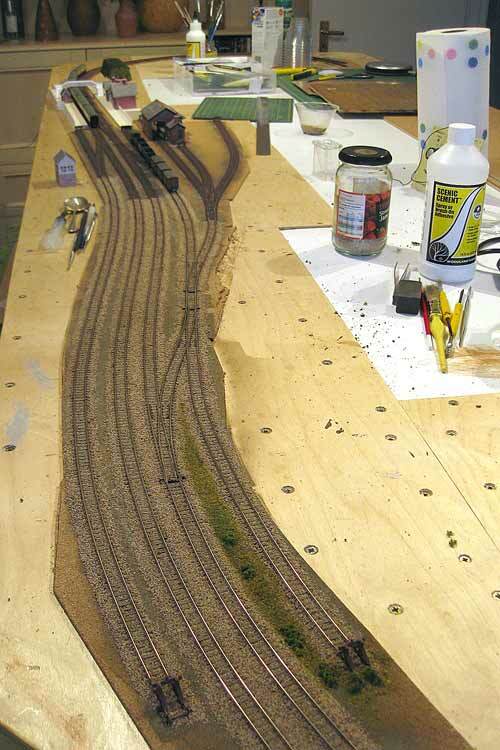 By early September the main lines, the down line kickback siding and the goods yard loop were laid (right). DCC Concepts Cobalt Digital point motors were fitted as each point was laid. Using these means that the spring built into the points can be removed and I also cut away all the parts to which Peco point motors would be mounted. Getting rid of all that plastic around the tie-bar does improve the look of the points somewhat. Initially the Cobalts were operated by a separate power supply but I'd already decided that the layout would be DCC. So two power rings were installed, one for the track, the other for the point motors. 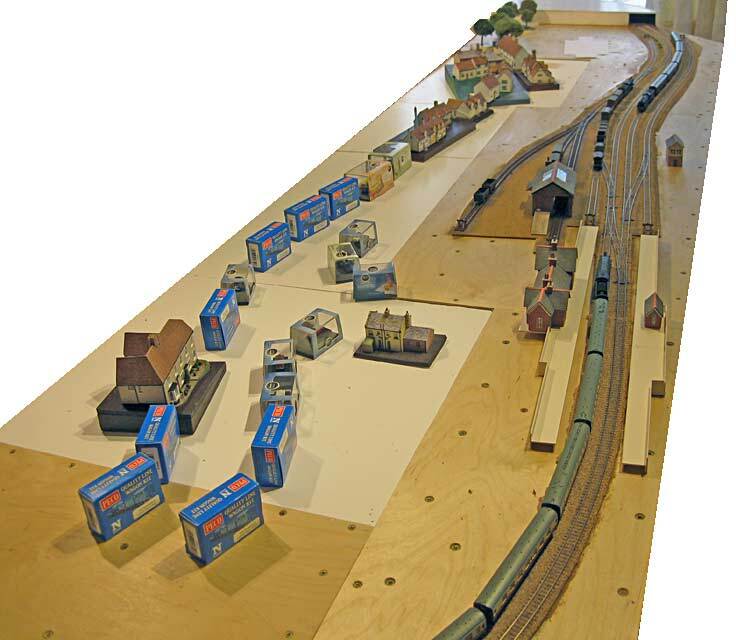 I kept to that arrangement when it came to installing the fiddle yard trackwork although by then I had bought the DCC Controller - a Prodigy DCC02. 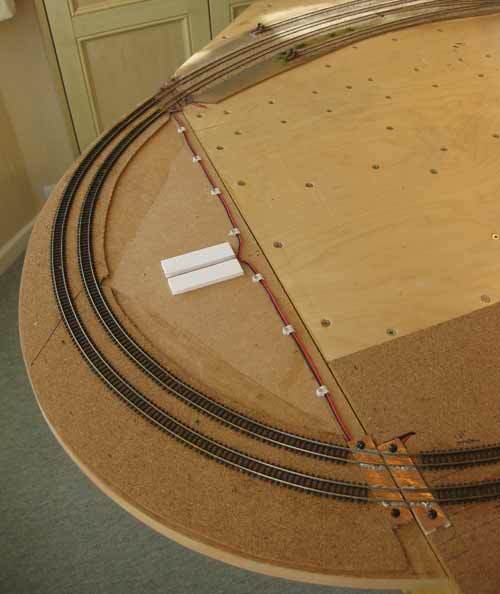 Although I had worked out how big the baseboard could be to fit comfortably in the room, a way of lengthening it slightly came to me while I was laying the track. The window at one end of the room is a curved bay. Routine access to the windows wouldn't be compromised if a small, round extension was hinged to the end of the baseboard so that it could be lowered out of the way when necessary. Tight fitting hinges were used to minimise risk of mis-alignment of the track. The extension is usually covered by suitably shaped removable cover made from 5mm foamboard which is held in the right position by the two small white pieces visible in the photo. 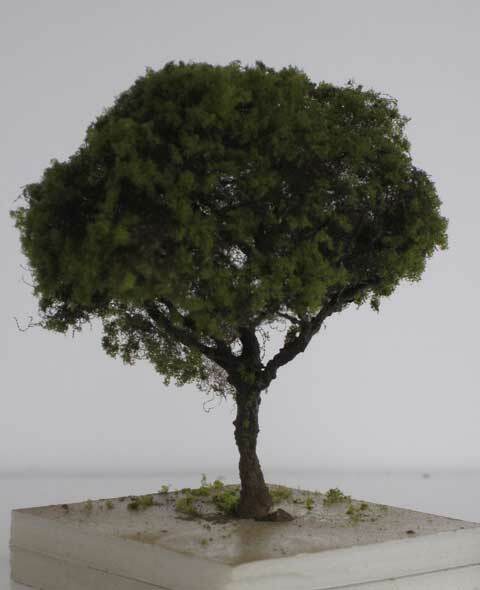 I haven't tried making any specific tree types, just generic tree like forms. Construction is by the twisted wire method. 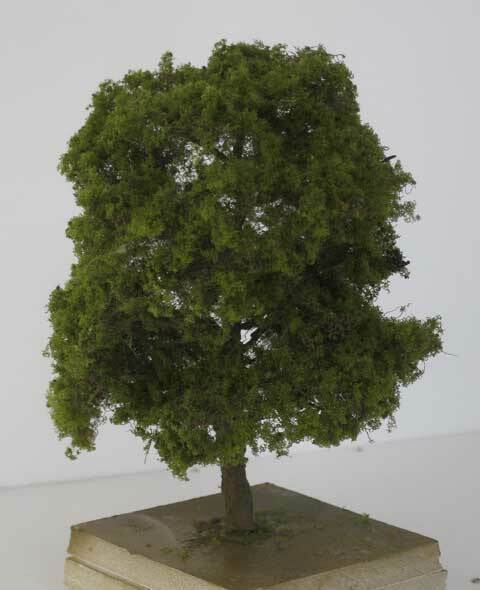 I had some unused loudspeaker cable which provided material for lots of trees. 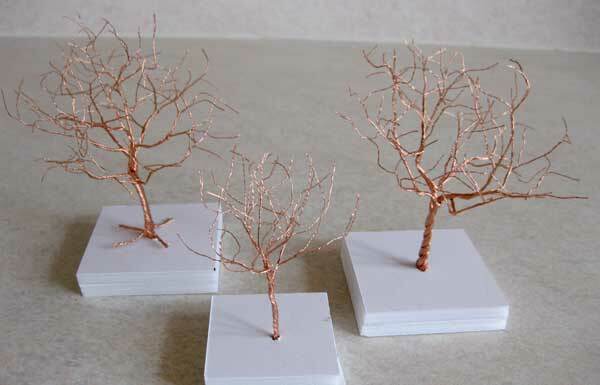 After twisting the wires I soldered the trunk and larger branches before coating them with a bark mixture. This consisted of Polyfilla mixed with PVA and a touch of raw umber acrylic paint. On the ends of the branches I added some tiny amounts of a material which is, I believe, used for stuffing teddy bears and the like. This supports the foliage. 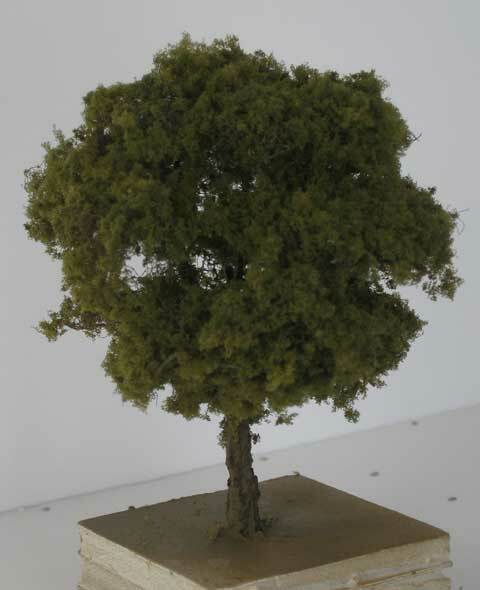 After a spray of paint I applied Woodland Scenics coarse grass. Here are some of my early efforts. Time to start ballasting. By all reports it's a pretty tedious task and that's how it turns out. I tried one of those ballast spreader thingies but found it easier to control the amount of ballast applied by using a good old-fashioned spoon. 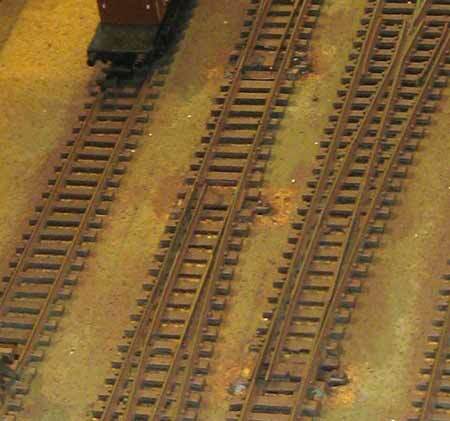 Ballast is a mix of two colours of Woodlands Scenics fine grade, two parts buff to one brown. This seems to give a bit more texture than using a single colour does. 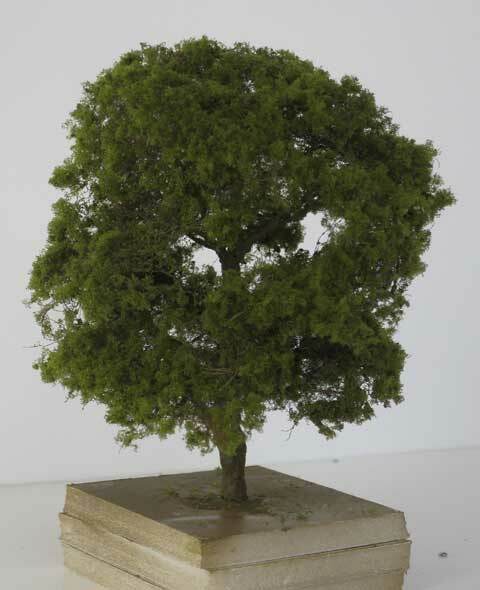 I decided against using PVA to stick it down and opted instead for Woodland Scenics Scenic Cement. This doesn't need the ballast to be pre-soaked and shouldn't be diluted. So that's a couple of variables eliminated. I used a syringe to drip the adhesive onto the ballast but a fair amount of ballast still got onto the sleepers. It was brushing and scraping these bits off that took the time. Around the point tie-bars the ballast was pre-mixed with adhesive and applied using an assortment of prodding and probing tools. Here's progress at the end of September - more than half done. I've still not decided if the layout of the goods yard is correct and I intend to ballast it differently, so that area won't be done for a while. Below, a J39 and a B1 meet on the newly ballasted track. And here's a close view of one of the points showing where surplus plastic has been cut away from around the tie bar. 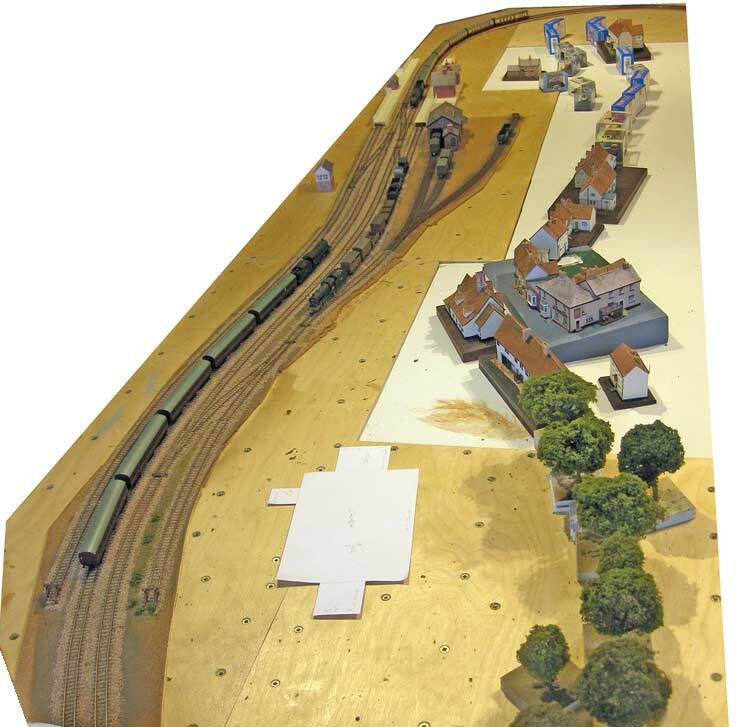 By mid-October all the track except the goods yard was ballasted. With the baseboard clear of clutter I arranged the buildings built so far to give some idea of their intended layout. The white shape in the foreground is the footprint of the church. It's a bit too big, so I'll have to find a way of reducing its size. And, viewed from the other end, small boxes stand in for buildings. The platforms are stricly temporary and the kit built station building will soon be replaced.